It's a simple idea: Give where you live. And this year, WBNA makes it simple to do, by organizing three local giving opportunities that promise a positive impact in the lives of neighbors. In our second year, WBNA’s Live Local, Give Local community giving campaign supports the West Side Schools Food Drive, the Buy Nothing Day Coat Drive, and the West End Community Center Holiday Toy Drive. Last year was a great success! With your help, we hope to give even more this holiday season to those in need in our neighborhood and community. Read on about how you can take part. Through Thursday, November 8. Our 3rd annual West Side Schools Food Drive is a community-led food drive to help families in need at three of our local public schools. This drive helps fill Holiday Food Baskets distributed to families before the Thanksgiving holiday. See our list of suggested food donations, or donate a $20 grocery gift card online, a super easy way to give! Donations of new canned/packaged food items as well as grocery gift cards can be dropped off through November 8 at WBNA Headquarters (M-Th, 8:30am-5pm) and at WBNA's Trick or Treat on Dexter Street event on Saturday, October 27 (4-6pm) in Dexter Park. COMING SOON! Look for our food drive donation bins at locations throughout the neighborhood. Locations to be announced shortly. Through Tuesday, November 20. For 22 years, the Buy Nothing Day Coat Exchange has brought coats and warm things to Providence families annually on the day after Thanksgiving. 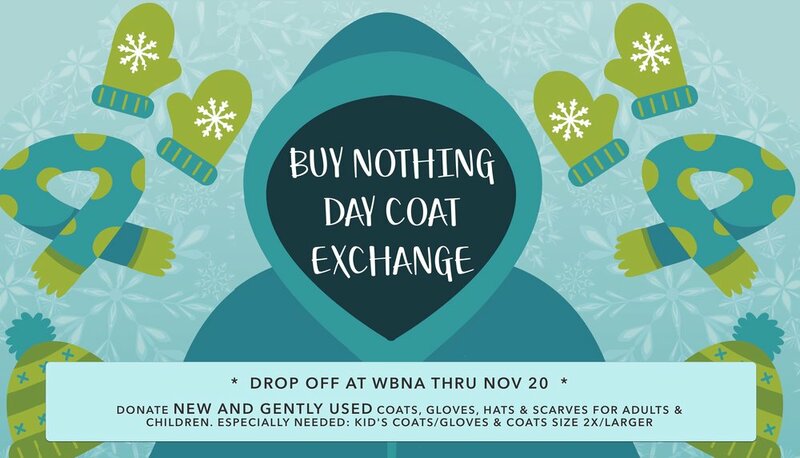 This year, WBNA asks you to help us collect a large amount of NEW AND GENTLY USED coats, gloves, hats, and scarves for CHILDREN AND ADULTS in support of this effort. Clean out your closets or buy some new, warm, winter outerwear for neighbors in need. See our list of needed items and learn more about this effort here. Drop off donations through Tuesday, November 20 at WBNA Headquarters (M-Th, 8:30am-5pm). Through Friday, December 14. WBNA is collecting new and unwrapped toys for the West End Community Center Holiday Toy Drive, benefitting children ages 18 months to 13 years of age who attend WECC's toddler, preschool and youth programs. WECC appreciates your donations of toys that promote learning and healthy play. Drop off donations at WBNA Headquarters (M-Th, 8:30am-5pm) through December 13, or at WECC (109 Bucklin Street, Providence) through December 14. Read more about the WECC Holiday Toy Drive and this important West End organization that is more than 40 years old. WBNA's Live Local, Give Local community giving campaign was started by neighbors who want to help people in need in our community and help support partner organizations that are helping neighbors. We know that there are charitable causes far-and-wide that deserve your support this season. We thank you for also considering those in need who are living in our community.